Data concerning the effect of trunk loads on the energy expenditure of various activities are scanty and partly conflicting. The energy expenditure of walking (4.5 km hr−1, 1.5% inclination) and ergometer cycling (60 watt, 60 rpm) was measured in 23 apparently healthy subjects with and without a trunk load of 10% of the body weight. For walking, the increment in energy expenditure per kg of load was 2.55±0.25 watt, while the increment per kg of body weight was 4.01±0.45 watt. For ergometer cycling, the increment per kg of load was 1.12±0.64 while that per kg of body weight was 2.73±0.56 watt. 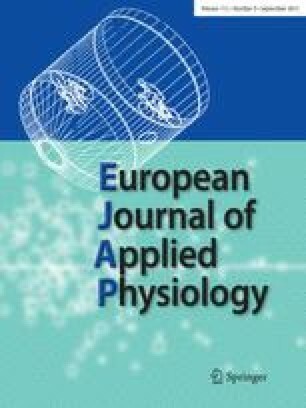 Prediction of energy expenditure for trunk loads has previously been made on the basis of the relation between energy expenditure and body weight. Our data show that this may lead to considerable overestimation.